The new product portfolio offers a range of different cutters for wire dimension up to 30 mm. From the classic leveraged cutter to the new one- or two-handed, ratchet operated cutters as well as the hammer cutter. All cutters are of best quality and have interchangeable edges. You will find a product presentation for download here. 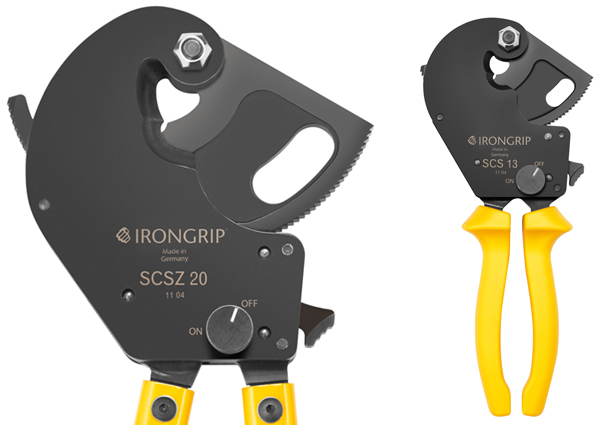 IronGrip recently launched a series of ratchet operated wire cutters. The smallest one-handed SCS13 cuts up to 13 mm steel wire but still fits nicely in the tool-box. The top of the range, two-handed SCSZ30 cuts 30 mm of steel wire without neither hydraulics nor sweat pearls. In between there are two more cutter sizes to provide the right size for the right application. Watch the video. Look here how simple it is to operate the new SCS13 single handed wire cutter.